having been lately circulated in the University, I think it necessary to submit the following letters to the perusal of my friends. J. White. Wadh. Coll. Feb. 24, 1790. 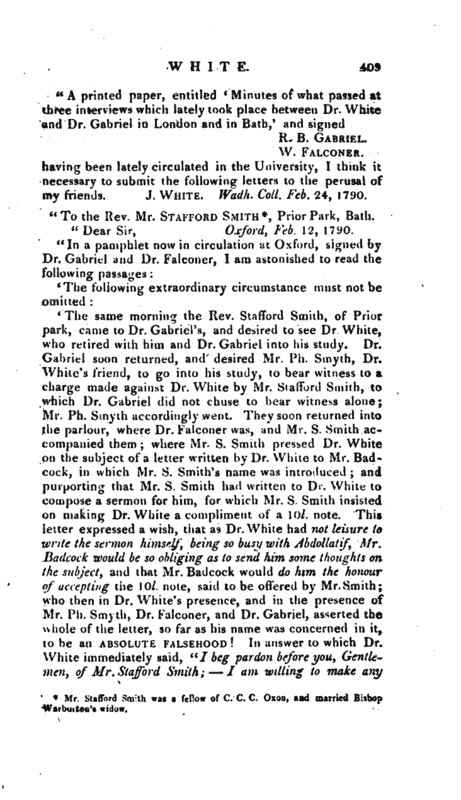 Mr. Stafford Smith was a fellow of C. C. C. Oxon, and married Bishop Warburton’s widow. 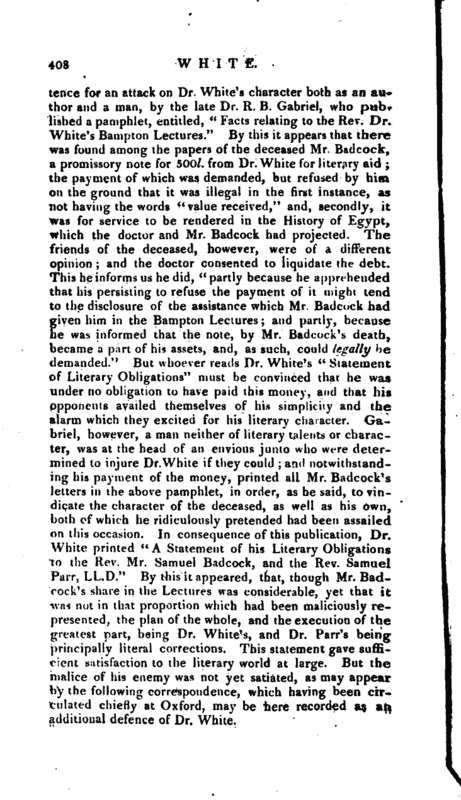 “The inference which every body must draw from these passages is, that you never did receive the sermon in question, and that I wantonly and wickedly made use of your name in order to procure it from Mr. Badcock for some other purpose. As you well know that 1 really sent you the aermon, I trust that 1 shall find in your candour a refuge from a misrepresentation at once so unexpected and so fatal. 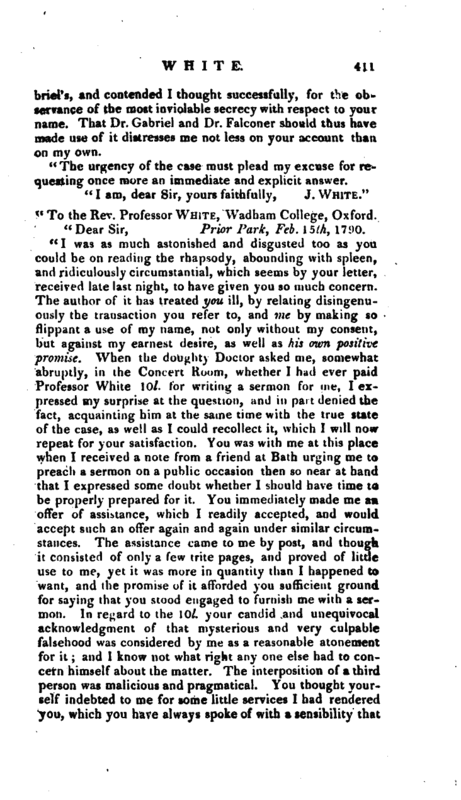 I trust that you will readily and explicitly acknowledge that you really asked and received the sermon from me; and that the apology I made to you, and which I shall ever be willing to repeat, related solely to the unjustifiable discovery of your name to Mr. Badcock, to the account I gave him of your application to me for the sermon, and of the sum which I said you had offered me. 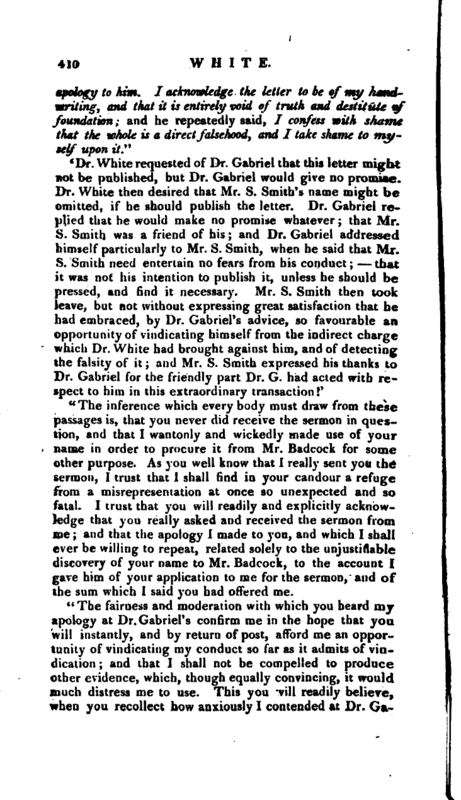 “The fairness and moderation with which you heard my apology at Dr. Gabriel’s confirm me in the hope that you will instantly, and by return of post, afford me an opportunity of vindicating my conduct so far as it admits of vindication; and that I shall not be compelled to produce other evidence, which, though equally convincing, it would much distress me to use. This you will readily believe, when you recollect how anxiously I contended at Dr. | Gabriel’s, and contended I thought successfully, for the observance of the most inviolable secrecy with respect to your name. That Dr. Gabriel and Dr. Falconer should thus have made use of it distresses me not less on your account than on my own. “The urgency of the case must plead my excuse for reqaesting once more an immediate and explicit answer. “To the Rev. Professor White, Wadham College, Oxford. Prior Park, Feb. 15th, 1790. “I was as much astonished and disgusted too as you could be on reading the rhapsody, abounding with spleen, and ridiculously circumstantial, which seems by your letter, received late last night, to have given you so much concern. The author of it has treated you ill, by relating disingenuously the transaction you refer to, and me by making so flippant a use of my name, not only without my consent, but against my earnest desire, as well as his own positive promise. When the doughty Doctor asked me, somewhat abruptly, in the Concert Room, whether I had ever paid Professor White 10l. for writing a sermon for me, I expressed my surprise at the question, and in part denied the fact, acquainting him at the same time with the true state of the case, as well as I could recollect it, which I will now repeat for your satisfaction. You was with me at this place when I received a note from a friend at Bath urging me to preach a sermon on a public occasion then so near at hand that I expressed some doubt whether I should have time to be properly prepared for it. You immediately made ( me ah offer of assistance, which I readily accepted', andt would accept such an offer again and again under similar circumstances. The assistance came to me by post, and though it consisted of only a few trite pages, and proved of little use to me, yet it was more in quantity than I happened to want, and the promise of it afforded you sufficient ground for saying that you stood engaged to furnish me with a sermon. In regard to the 10l. your candid and unequivocal acknowledgment of that mysterious and very culpable falsehood was considered by me as a reasonable atonement for it; and I know not what right any one else had to concern himself about the matter. The interposition of a third person was malicious and pragmatical. You thought yourself indebted to me for some little services I had rendered you, which you have always spoke of with a sensibility that | did you honour and you probably meant in this instance, the only one that ever occurred, to make me some compensation for it. 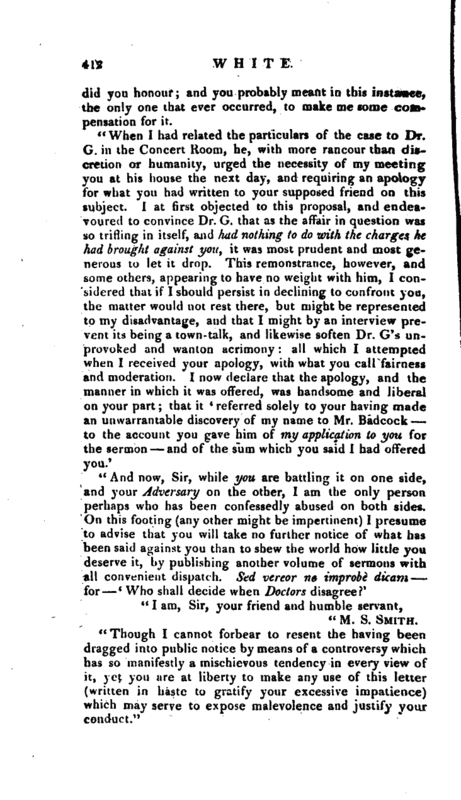 “Though I cannot forbear to resent the having been dragged into public notice by means of a controversy which has so manifestly a mischievous tendency in every view of it, yet you are at liberty to make any use of this letter (written in haste to gratify your excessive impatience) which may serve to expose malevolence and justify your conduct.” | About the same year, 1790, in which these transactions occurred, the professor vacated his fellowship by marriage, and accepted of a college living, the rectory of Melton, in Suffolk, on which he resided during a considerable part of the year. In 1800, appeared his “Diatessaron, sive integra historia Domini nostri Jesu Christi, Grsece,” &c. 8vo. This was founded on the “Harmony” of archbishop Newcome, and is elegantly printed on a type cast originally under the direction of the professor. 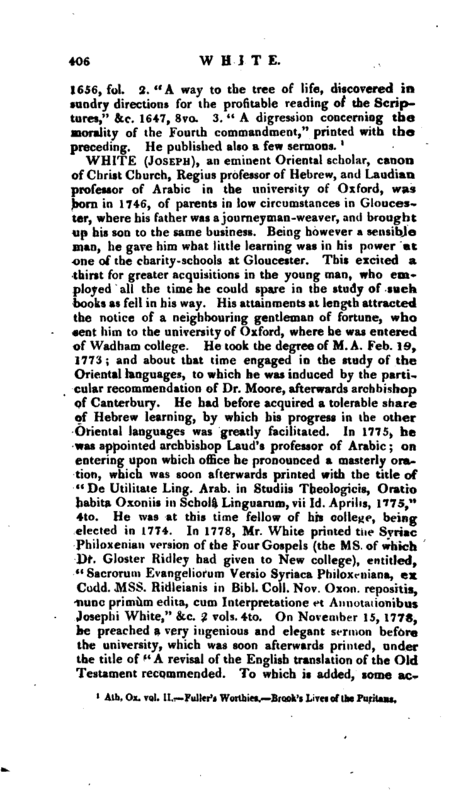 In 1801, he published his “Ægyptiaca or Observations on certain. Antiquities of Egypt. In two parts I. The History of Pompey’s Pillar elucidated. 2. Abdollatif’s Account of the Antiquities of Egypt> written in Arabic, A. D. 1206. Translated into English, and illustrated with Notes.” 4to. This is perhaps, as to research and learning, the most profound of his works on the subject of antiquity. Dr. White’s next publication was an edition of the Greek Testament, “Novum Testamentum, Greece. Lectiones variantes, Griesbachii judicio, iis quas Textus receptus exhibet, anteponendas vel eequiparandas, adjecit Josephus White,” &c. 2 vols. cr. 8vo, 18O8. 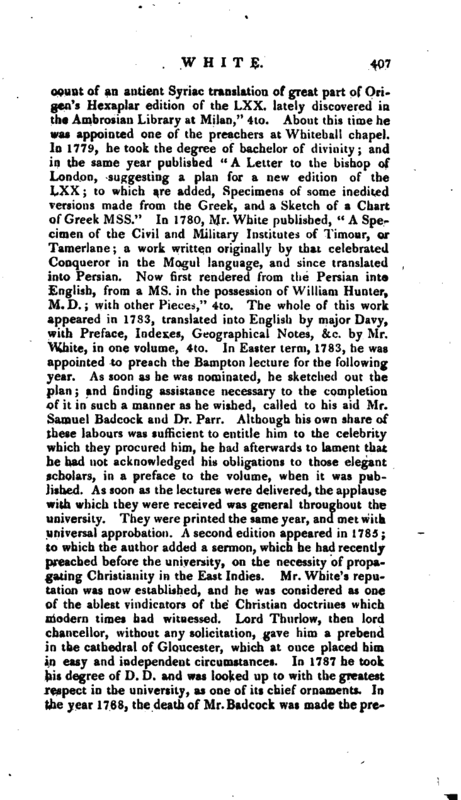 This edition is particularly valuable for the ready and intelligible view it affords, first, of all the texts which in Griesbach’s opinion ought either certainly or probably to be removed from the received text; secondly, of those various readings which the same editor judged either preferable or equal to those of the received text; thirdly, of those additions which, ou the authority of manuscripts Griesbach considers as fit to be admitted into the text. From this Dr. White observes that it may be seen at once by every one how very little, after all the labours of learned men, and the collation of so many manuscripts, is liable to just objection in the received text. As a kind of sequel, and printed in the same form, he published in 1811, “C risers Griesbachianse in. 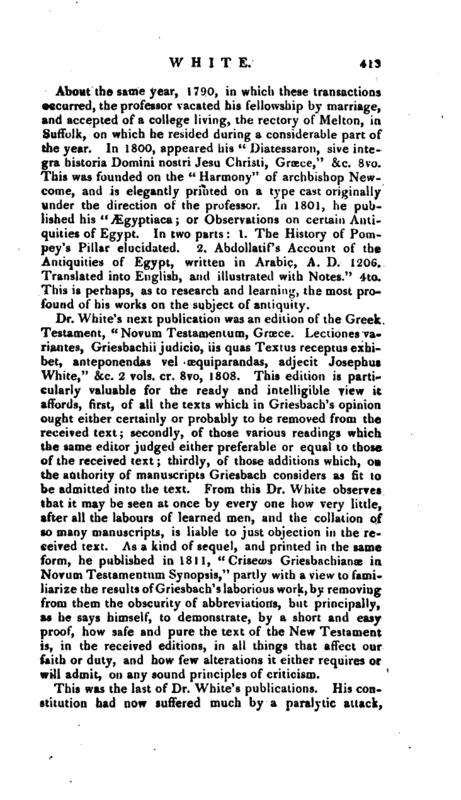 Novum Testamentum Synopsis,” partly with a view to familiarize the results of Griesbach’s laborious work, by removing from them the obscurity of abbreviations, but principally, as he says himself, to demonstrate, by a short and easy proof, how safe and pure the text of the New Testament is, in the received editions, in all things that affect our faith or duty, and how few alterations it either requires or will admit, on any sound principles of criticism. Gent. Mag. vol. LXXXIV. 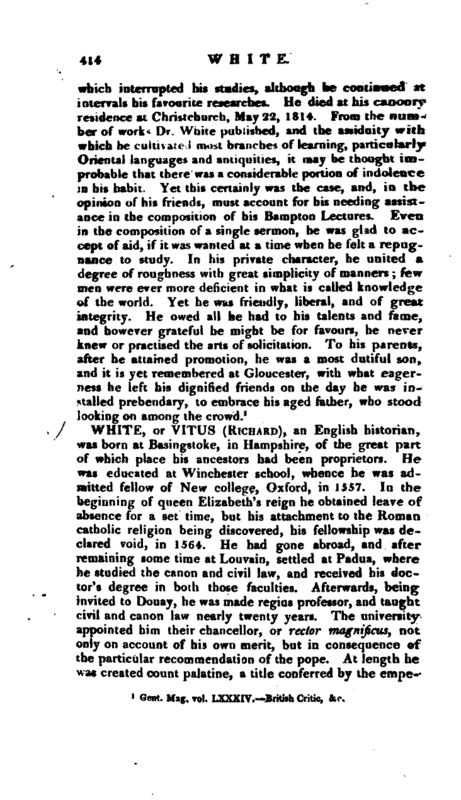 British Critic, &e.